I tend to save things. Special things, anyway. I’m not a hoarder, by any stretch. In fact, I am often accused of selling one too many things in a garage sale when my hubby can’t find something in his shop. I’m not admitting guilt when it comes to his misplaced items. But it is true that I don’t like clutter. It jumbles my brain to have random stuff stacked around doing nothing, and the last thing I need is a cluttered head. I have a hard enough time keeping my “thought files” in any kind of order as it is. But there is a world of difference, in my estimation, between old clutter and treasures of the past. I have a few boxes of things saved from my children’s growing-up years. And I have a handful of things from my own childhood. I wish I had a few more. My daughter was rambling through a box from my sewing room storage the other day. She left a couple of things out in the floor, and when I went to my sewing room to work on a project, I saw my old plastic Barbie box. Inside were some tiny treasures. My mama just celebrated her 75th birthday this month. She doesn’t sew much anymore, but I remember watching her use her Kenmore sewing machine to make Karen and me school dresses when we were little. We don’t have any of those saved from childhood, but I do have a few tiny Barbie outfits that she sewed from scraps of our dresses. 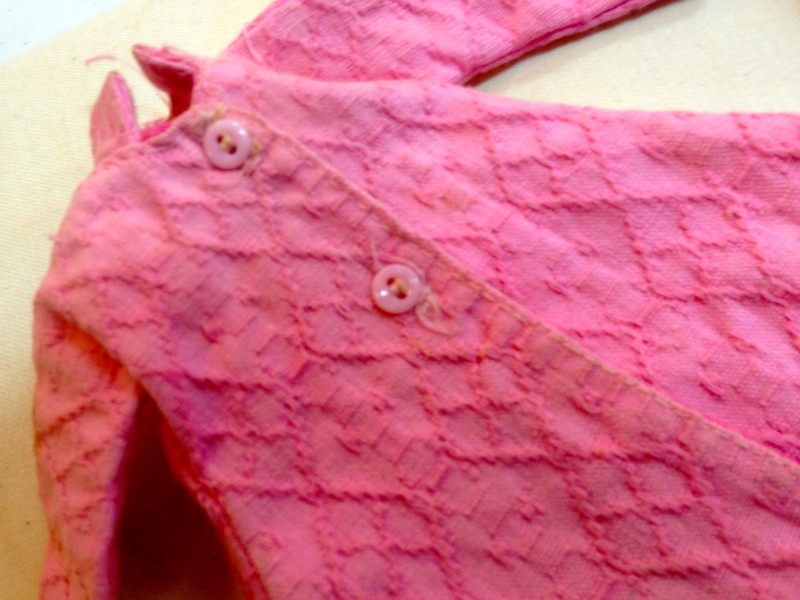 Inside the box was a teeny tiny swing coat made from a thread-patterned pink cotton. I don’t know how she managed to make them, but there are two miniature buttonholes! I also found two gathered skirts with a waistband and snap enclosures. And there was a dress with a fitted bodice and round skirt made from a floral cotton. I think the coat was for one of our Barbie dolls. The dress was for my Skipper doll, which was (if memory serves) Barbie’s little sis. The two skirts fit both of them, I think. I’m fairly certain she had a pattern for the coat and dress, but the skirts she made by just measuring the waist of the doll. I have a memory of sewing pieces of fabric together with a needle and thread, sitting in the floor while she sat at her machine. I was intrigued with the process, as I watched my mom produce dresses and skirts and coats for me, my sister, and our dolls. She tells me now that she didn’t necessarily love sewing back then, but it was a way to save money. 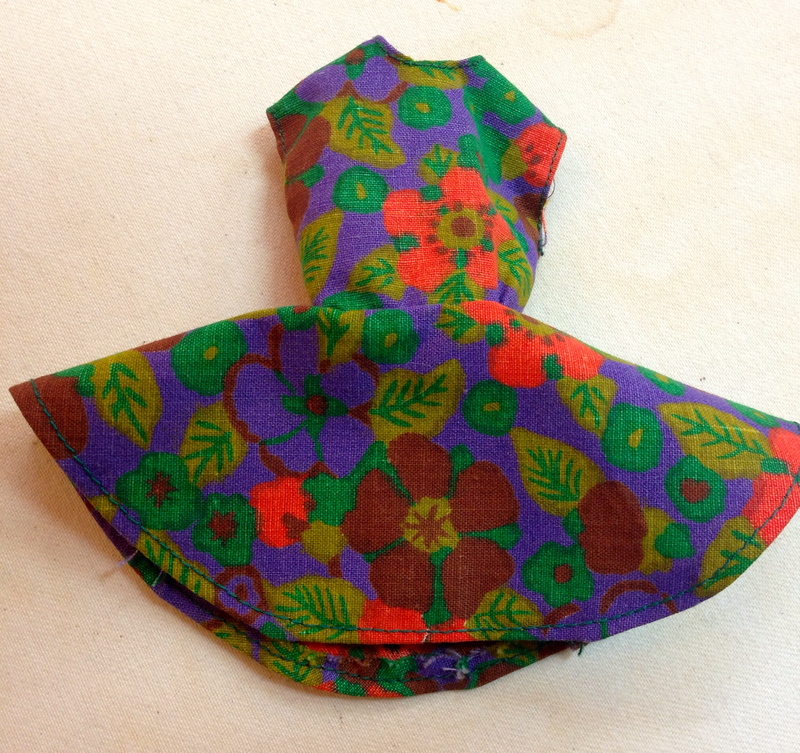 Buying fabric was a lot less expensive than buying ready-made clothes. I have some other Barbie clothes that I saved that were store-bought. They are also pieces of my childhood, and I’m glad to have them. But there is really no comparison to those manufactured clothing items, and the ones my mama made. Not only are they made with more love, but they are made with more care for details and with better-quality fabrics. The bought ones cost more, but are not nearly as well-made. Today, I sew because I love to sew. I don’t do it to save money. Frankly, with stores like T J Max and other discount stores, you can buy clothes cheaper than you can make them. Or at least as cheap. But once you learn to fit a pattern to your body, you can sew clothes that fit better than those hanging in the stores, and you can make something no one else has. It’s a matter of artistic expression for me. 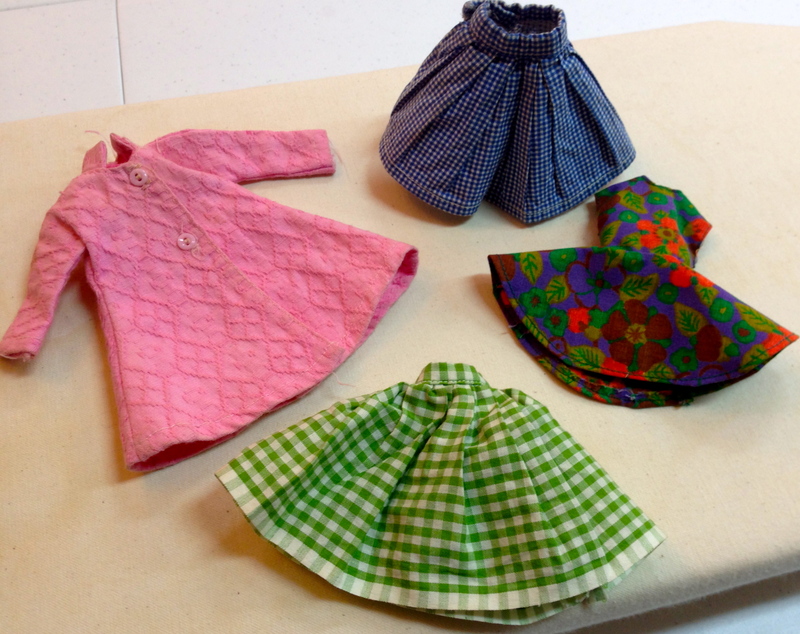 Looking at these tiny treasures, I’d say it was artistic expression for my mom as well, even though her reasons for sewing were more utilitarian than mine and Karen’s reasons are today. Thank you, Mama. From your daughters who love you.